Edge Pro Matrix Diamond Stones require special consideration when it comes to leveling and cleaning. This version of the Edge Pro Stone Leveling Kit uses aluminum oxide as the abrasive, which is the perfect match for the Matrix Diamond Stones. is used to restore your stones to their original flatness, keeping them in prime condition. 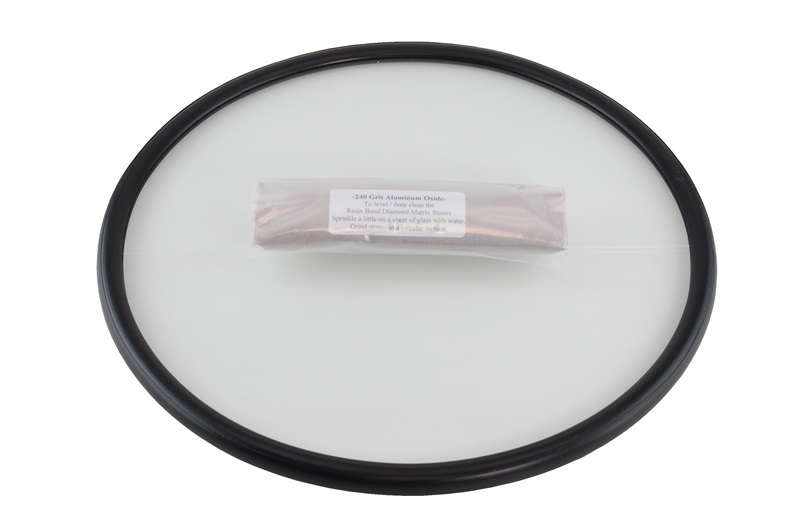 The Stone Leveling Kit consists of a 12” diameter, ¼” thick piece of glass, w/ rubber molding installed around the circumference, and a ½ pound bag of 240 grit aluminum oxide. To use, sprinkle about a ½ teaspoon of the aluminum oxide on the glass, and add a little water. By rubbing the stone against the abrasive grit, you will clean waste metal from the surface and grind any high spots of the stone down until it is level again. The Edge Pro Stone Leveling Kit makes a great base for your Edge Pro Apex or Professional models. 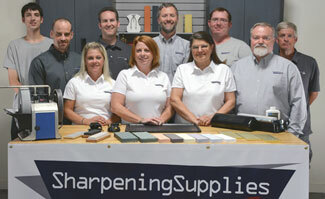 After leveling your sharpening stones, clean the glass plate and turn it over. The opposite side is a perfect surface for mounting your sharpener. The rubber guard will help contain metal shavings and deaden the sound created from leveling stones. Edge Pro products are manufactured in the US. Q. What should I use to level my Edge Pro Standard Stones? A. You should use the Edge Pro Stone Leveling Kit with 60 Grit Silicon Carbide to level Standard Edge Pro Stones.